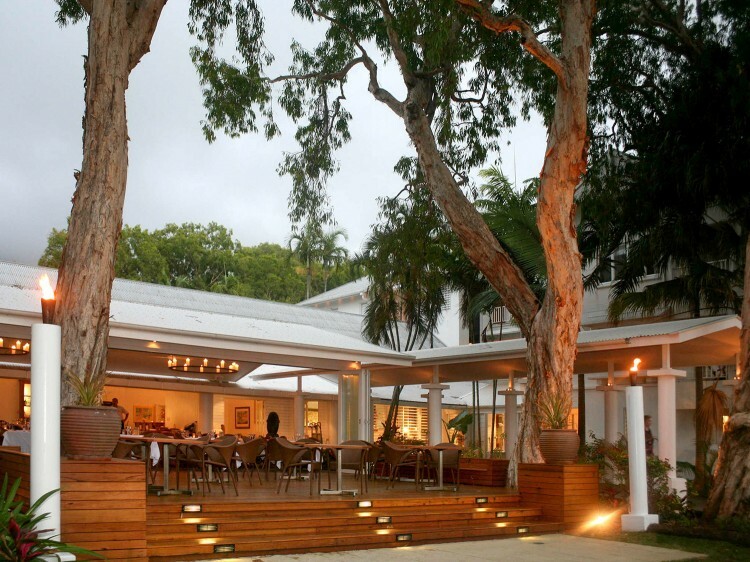 The Reef House Resort & Spa is situated amongst tranquil tropical gardens and ancient towering paperbark trees. 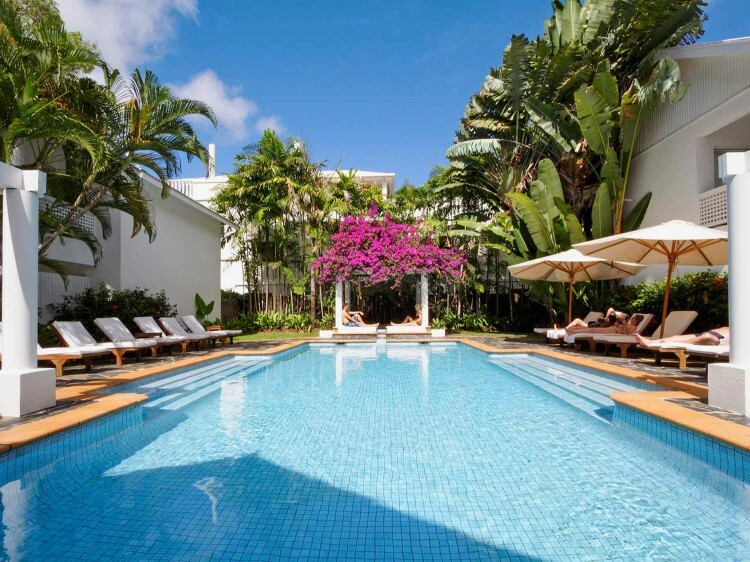 The colonial-style architecture is designed to capture the romance of the tropics and the charm of a bygone era. Candle-lit corridors and fresh white washed walls give way to three pristine pools and two spas. The award winning Reef House Restaurant offers a superb dining experience with unsurpassed ocean views, while the poolside cafe is the perfect spot to enjoy a light snack, meal, or cocktail beside the hotel’s freshwater pool, shaded by palm trees, rambling bougainvillea and a cascading waterfall. Previously a VIP guesthouse owned by Army Brigadier David Thompson, The Reef House Resort and Spa has maintained its history and traditions throughout the years. Every evening candles are lit around the resort at sundown and guests gather to share their stories over a complimentary glass of Brigadiers Punch. The resort also boasts the only true honour bar on mainland Australia, similar to an Officers Mess from yesteryear. Each of the 69 rooms and suites feature oversize beds draped in light muslin netting, warm teak furniture and wide verandahs to ensure guests are given an “experience”, not just a room. Some rooms also offer a private Jacuzzi and twin bedding is also available upon request. 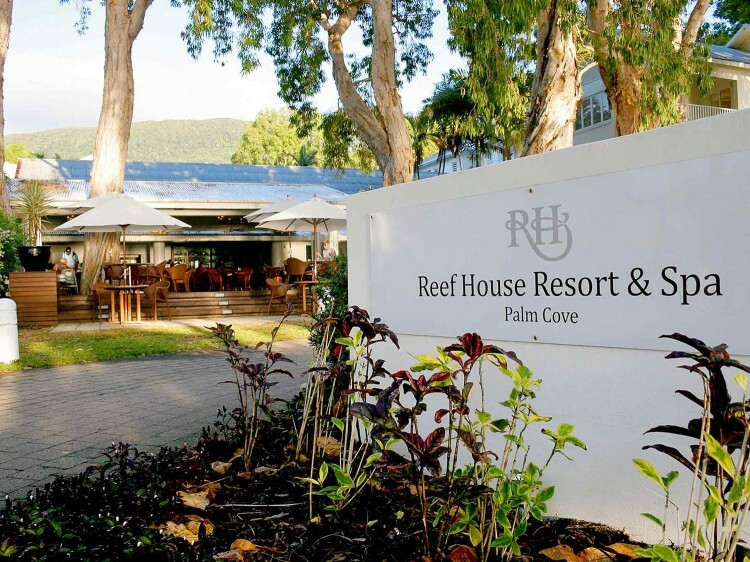 Complimentary book and board game library and exceptional service are just some of the additional features on offer at The Reef House Resort & Spa to ensure your stay is memorable. The resort's three pools are framed by shaded pathways and vibrant tropical flora, creating a magnificent backdrop to candle-lit corridors and white wash buildings. Take your pick from two picturesque freshwater pools, a sheltered saltwater pool or two inviting spas (one of which is heated). Reef House Restaurant - set under 300 year old Melaleuca gums swaying in the sea breeze, looking out across the teak decking to the palms of the cove and the Coral Sea beyond, the restaurant features an eclectic choice of dishes from around the world - the Middle East, Southern Asia, the Mediterranean and beyond - created from the North’s unique produce and products. Brigadiers Bar - experience the charm of yesteryear and enjoy an intimate retreat into tranquility, charmed luxury and service excellence. Candles lit at twilight announce the bar's official opening, and service of complimentary punch also commences at this time. The process is a time honoured tradition of the resort. Artefacts and books of the Brigadier's travels are also available for guests to peruse at leisure along with a library collection on books and magazines to enjoy. Poolside Dining - exclusive to Reef House guests, the Poolside Café is the perfect place to relax and have a casual drink or light meal. The tranquil enviroment of rainforest surrounds overlooking the freshwater pool and cascading waterfall, this is your private spot for lazing the day away in paradise. Enjoy luxuriously pampering treatments at the award-winning Reef House Day Spa, voted No.2 "Best Spa" in Australasia/South Pacific and voted in the "Best Top 10 Spas in the World" (Conde Nast Spa Awards, 2008). Therapies include facials, head and body treatments, speciality massages to name just a few and are based on ancient Aboriginal techniques and medicines combined with Li’Tya natural spa products. Elegantly designed to capture the charm of the original Brigadier's House in Palm Cove, these studio style rooms feature a private balcony or terrace with an unexpected luxury of a hanging couples swing - a perfect place to watch the sunset or laze the day away soaking up the Palm Cove lifestyle. 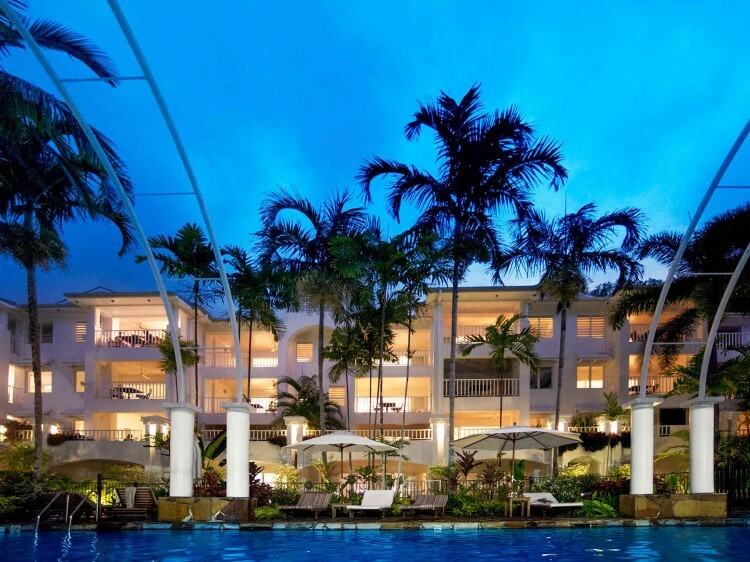 Brigadier Rooms feature lagoon pool or tropical garden views. Average size 34sqm. Feature supreme privacy with the luxury of large tropical verandahs providing uninterrupted lagoon pool or tropical garden views. Designed to maximise the indoor and outdoor lifestyle of Tropical North Queensland, featuring cool terracotta tiles, white bed linen and romantic muslin netting. Outdoor entertaining area with mini bar and microwave. Average size 54sqm incl balcony. Perfect for a romantic escape, experience sheer indulgence with an outdoor couples spa set in the privacy of their own balcony or verandah. Featuring tropical garden or lagoon pool views, these rooms provide spacious serenity with colonial style furniture, complete with romantic muslin netting, white bed linen and cool terracotta tiles throughout. Outdoor entertaining area with mini bar and microwave. Average size 66sqm incl balcony.